The prevalence in gender wage gap and a lack of representation for non-White employees is a continued reality amongst online companies. Online companies and their company culture have frequently been criticized as unwelcoming towards women and minorities. For example, in 2017 only 26 percent of employees in computing-related occupations in the United States were female. In computer and mathematical occupations the recorded percentage of employed workers from minority groups was just 8.7 percent for African-Americans in 2017. This is in spite of the fact that African-Americans make up the second largest minority group in the United States. Beginning in the summer of 2014, many prominent U.S.-based online companies began publishing diversity reports and publicly stated their commitment to increasing diversity within their own workforce but change has been slow and lacking. As of 2018, only 20 percent of Fortune 500 companies had a female employed as a Chief Information Officer (CIO). Despite all the public assurances, online companies are still disproportionately dominated by white male employees. The distribution of Google employees in 2018 saw a ratio of less than one female for two male employees and despite having a female CEO, female employees made up a mere 37 percent in the distribution by gender of Yahoo employees in 2016. 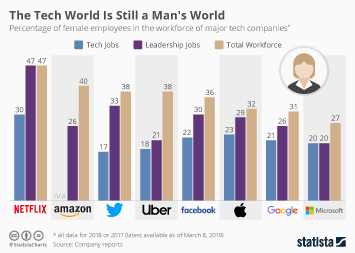 Female employment in tech departments remains very low. For example, in 2018 only 21.6 percent of Facebook employees working in the company’s tech departments were female. Because of the use of data that include ethnicity on EEO-filings, data on the ethnic diversity of company employees only pertain to the U.S. Asians possess the largest representation amongst minority groups in online companies. As an example, Google's U.S. workforce was 36.3 percent Asian in 2018, compared to 2.5 percent of Black employees. Non-white minorities, including Asians, experience the lowest level of representation in online companies at senior level positions. In 2018, 69.7 percent of Facebook senior level positions were held by Whites while only 3.3 and 2.4 percent respectively was held by Hispanic and Black employees respectively.